Cellular packaging of DNA Histones are highly alkaline proteins found in eukaryotic cell nuclei that package and order the DNA into structural units called nucleosomes. They are the chief protein components of chromatin, acting as spools around which DNA winds, and play a role in gene regulation. Without histones, the unwound DNA in chromosomes would be very long (a length to width ratio of more than 10 million to one in human DNA). How DNA is packaged in our cells? Each of us has enough DNA to reach from here to the sun and back, more than 300 times. How is all of that DNA packaged so tightly into chromosomes and squeezed into a tiny nucleus? Eukaryotic chromosomes contain an enormous amount of DNA relative to their condensed length. Each chromosome contains a single linear DNA double helix that, in humans, averages about 1.5 × 108 nucleotide pairs. If completely stretched out, such a DNA molecule would be about 4 cm long, thousands of times longer than the diameter of a cell nucleus. All this DNA, as well as the DNA of the other 45 chromosomes fits into the nucleus through the elaborate, multilevel system of DNA packing. Structure of a nucleosome The nucleosome core particle contains two copies of each histone protein (H2A, H2B, H3 and H4) and 146 base pairs (bp) of super-helical DNA wrapped around this histone octomer. It represents the first order of DNA packaging in the nucleus. The answer to this question lies in the fact that certain proteins compact chromosomal DNA into the microscopic space of the eukaryotic nucleus. These proteins are called histones, and the resulting DNA-protein complex is called chromatin. It may seem paradoxical that proteins are added to DNA to make it more compact. However, if you have ever tried to store a garden hose, you know that it is much easier to do so if you begin by coiling the hose. Of course, coiling requires work, and energy is needed to perform work. Thus, within the nucleus, histones provide the energy (mainly in the form of electrostatic interactions) to fold DNA. As a result, chromatin can be packaged into a much smaller volume than DNA alone. Histones are a family of small, positively charged proteins termed H1, H2A, H2B, H3, and H4. DNA is negatively charged, due to the phosphate groups in its phosphate-sugar backbone, so histones bind with DNA very tightly. Histones play a major role in DNA foldingThis schematic view illustrates sequence-specific DNA-binding proteins. These proteins bind tightly to DNA. The basic repeating structural (and functional) unit of chromatin is the nucleosome, which contains nine histone proteins and about 166 base pairs of DNA. The observation by electron microscopists was that chromatin appeared similar to beads on a string. H2A, H2B, H3, and H4 form a discrete protein octamer, which is fully consistent with the presence of a repeating histone-containing unit in the chromatin fiber. Today, researchers know that nucleosomes are structured as follows: Two each of the histones H2A, H2B, H3, and H4 come together to form a histone octamer, which binds and wraps about 1.7 turns of DNA, or about 146 base pairs. The addition of one H1 protein wraps another 20 base pairs, resulting in two full turns around the octamer. Obviously, 166 base pairs are not very much, as each chromosome contains over 100 million base pairs of DNA on average. Therefore, every chromosome contains hundreds of thousands of nucleosomes, and these nucleosomes are joined by the DNA that runs between them (an average of about 20 base pairs). This joining DNA is referred to as linker DNA. Each chromosome is thus a long chain of nucleosomes, which gives the appearance of a string of beads when viewed using an electron microscope. The amount of DNA per nucleosome was determined by treating chromatin with an enzyme that cuts DNA (such enzymes are called DNases). One such enzyme, micrococcal nuclease (MNase), has the important property of preferentially cutting the linker DNA between nucleosomes well before it cuts the DNA that is wrapped around octamers. By regulating the amount of cutting that occurs after application of MNase, it is possible to stop the reaction before every linker DNA has been cleaved. At this point, the treated chromatin will consist of mononucleosomes, dinucleosomes (connected by linker DNA), trinucleosomes, and so forth. If DNA from MNase-treated chromatin is then separated on a gel, a number of bands will appear, each having a length that is a multiple of mononucleosomal DNA. The simplest explanation for this observation is that chromatin possesses a fundamental repeating structure. When this was considered together with data from electron microscopy and chemical cross-linking of histones, the "subunit theory" of chromatin was adopted. The subunits were later named nucleosomes and were eventually crystallized. Packaging of DNA into nucleosomes Nucleosomes form the fundamental repeating units of eukaryotic chromatin, which is used to pack the large eukaryotic genomes into the nucleus while still ensuring appropriate access to it. Nucleosomes are folded through a series of successively higher order structures to eventually form a chromosome. The packaging of DNA into nucleosomes shortens the fiber length about sevenfold. In other words, a piece of DNA that is 1 meter long will become a "string-of-beads" chromatin fiber just 14 centimeters (about 6 inches) long. Despite this shortening, a half-foot of chromatin is still much too long to fit into the nucleus, which is typically only 10 to 20 microns in diameter. Therefore, chromatin is further coiled into an even shorter, thicker fiber, termed the "30-nanometer fiber," because it is approximately 30 nanometers in diameter. Thus, the 30-nanometer fiber may be highly irregular and not quite the uniform structure depicted in textbooks. Interestingly, histone H1 is very important in stabilizing chromatin higher-order structures, and 30-nanometer fibers form most readily when H1 is present. Processes such as transcription and replication require the two strands of DNA to come apart temporarily, thus allowing polymerases access to the DNA template. However, the presence of nucleosomes and the folding of chromatin into 30-nanometer fibers pose barriers to the enzymes that unwind and copy DNA. It is therefore important for cells to have means of opening up chromatin fibers and/or removing histones transiently to permit transcription and replication to proceed. 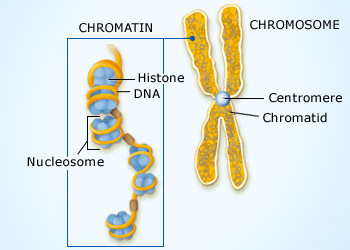 Generally speaking, there are two major mechanisms by which chromatin is made more accessible: Histones can be enzymatically modified by the addition of acetyl, methyl, or phosphate groups or can be displaced by chromatin remodeling complexes, thereby exposing underlying DNA sequences to polymerases and other enzymes. It is important to remember that these processes are reversible, so modified or remodeled chromatin can be returned to its compact state after transcription and/or replication are complete. Dividing cells. 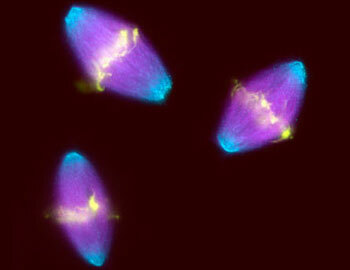 Fluorescent light micrograph of cells during the metaphase stage of mitosis (cell division). DNA genetic material is yellow and the microtubules of each cell's cytoskeleton are pink, forming a microtubule spindle. The poles of the spindle are light blue. During metaphase, the chromosomes (which contain the DNA) form a line (the metaphase plate) on the microtubule spindle. The microtubules drag the chromosomes apart towards each pole to form two identical sets for the two genetically identical daughter cells that are the end product of mitosis. 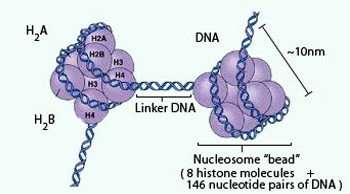 A nucleosome contains a protein core made of eight histone molecules. 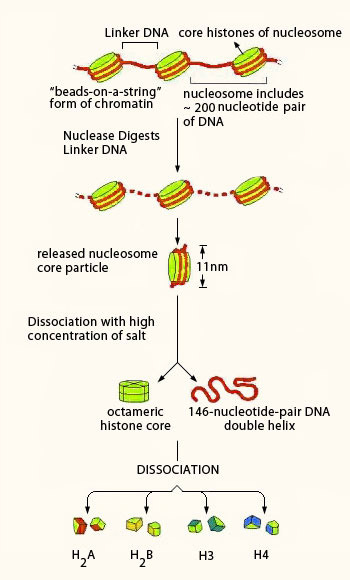 As indicated, the nucleosome core particle is released from chromatin by digestion of the linker DNA with a nuclease, an enzyme that breaks down DNA. (The nuclease can degrade the exposed linker DNA but cannot attack the DNA wound tightly around the nucleosome core.) After dissociation of the isolated nucleosome into its protein core and DNA, the length of the DNA that was wound around the core can be determined. This length of 146 nucleotide pairs is sufficient to wrap 1.65 times around the histone core. Chromosomes Are Most Compacted During Metaphase: When eukaryotic cells divide, genomic DNA must be equally partitioned into both daughter cells. To accomplish this, the DNA becomes highly compacted into the classic metaphase chromosomes that can be seen with a light microscope. Once a cell has divided, its chromosomes uncoil again. Comparing the length of metaphase chromosomes to that of naked DNA, the packing ratio of DNA in metaphase chromosomes is approximately 10,000 : 1 (depending on the chromosome). This can be thought of as akin to taking a rope as long as a football field and compacting it down to less than half an inch. This level of compaction is achieved by repeatedly folding chromatin fibers into a hierarchy of multiple loops and coils. Exactly how this is accomplished is unclear, but the phosphorylation of histone H1 may play a role. Indeed, this is just one area of DNA packaging that researchers will continue to explore in the years to come. Regulation of Gene Expression: All organisms must regulate which genes are expressed at any given time. Both unicellular organisms and the cells of multicellular organisms must continually turn genes on and off in response to signals from their external and internal environments. The cells of a multicellular organism must also regulate their gene expression on a more long-term basis. During development of a multicellular organism, its cells undergo a process of specialization in form and function called cell differentiation, resulting in several or many differentiated cell types. The mature human body, for instance, is composed of about 200 different cell types. Examples are muscle cells and nerve cells. Regulation of Chromatin Structure: A flurry of recent research indicates that certain chemical modifications to the histones and DNA of chromatin influence both chromatin structure and gene expression. Here we examine the effects of these modifications, which are catalyzed by specific enzymes. 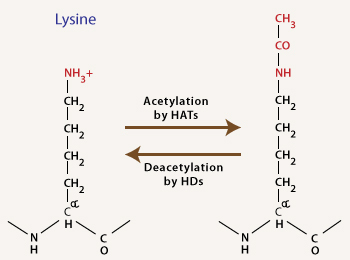 Acetylation and deacetylation of the lysine residue Acetylation of the lysine residues at the N terminus of histone proteins removes positive charges, thereby reducing the affinity between histones and DNA. This makes RNA polymerase and transcription factors easier to access the promoter region. Therefore, in most cases, histone acetylation enhances transcription while histone deacetylation represses transcription. Modification of a particular position in a histone tail can take on different meanings depending on other features of the local chromatin structure. There is mounting evidence that chemical modifications to histones play a direct role in the regulation of gene transcription. The N-terminus of each histone molecule in a nucleosome protrudes outward from the nucleosome. These histone tails are accessible to various modifying of specific chemical groups. Histones act as a spool around which DNA can wind. When histones are modified after they are translated into protein (i.e., post-translation modification), they can influence how chromatin is arranged, which, in turn, can determine whether the associated chromosomal DNA will be transcribed. If chromatin is not in a compact form, it is active, and the associated DNA can be transcribed. Conversely, if chromatin is condensed (creating a complex called heterochromatin), then it is inactive, and DNA transcription does not occur. There are two main ways histones can be modified: acetylation and methylation. These are chemical processes that add either an acetyl or methyl group, respectively, to the amino acid lysine that is located in the histone. Acetylation is usually associated with active chromatin, while deacetylation is generally associated with heterochromatin. Histone acetylation is catalyzed by histone acetyltransferases (HATs) and histone deacetylation is catalyzed by histone deacetylases (denoted by Hds or HDACs). On the other hand, histone methylation can be a marker for both active and inactive regions of chromatin. For example, methylation of a particular lysine (K9) on a specific histone (H3) that marks silent DNA is widely distributed throughout heterochromatin. This is the type of epigenetic change that is responsible for the inactivated X chromosome of females. In contrast, methylation of a different lysine (K4) on the same histone (H3) is a marker for active genes. A chemical process that adds a methyl group to DNA A methyl group is added to the 5-carbon position of cytosine residues in DNA. There are many ways that gene expression is controlled in eukaryotes, but methylation of DNA is a common epigenetic signaling tool that cells use to lock genes in the "off" position. In recent decades, researchers have learned a great deal about DNA methylation, including how it occurs and where it occurs, and they have also discovered that methylation is an important component in numerous cellular processes, including embryonic development, genomic imprinting, X-chromosome inactivation, and preservation of chromosome stability. Given the many processes in which methylation plays a part, it is perhaps not surprising that researchers have also linked errors in methylation to a variety of devastating consequences, including several human diseases. DNA methylation is a chemical process that adds a methyl group to DNA. It is highly specific and always happens in a region in which a cytosine nucleotide is located next to a guanine nucleotide that is linked by a phosphate; this is called a CpG site. 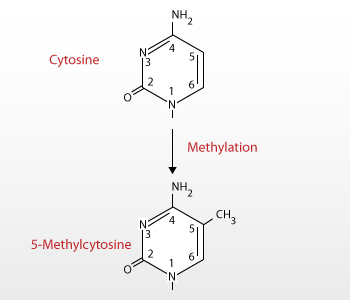 CpG sites are methylated by one of three enzymes called DNA methyltransferases (DNMTs). Inserting methyl groups change the appearance and structure of DNA, modifying a gene's interactions with the machinery within a cell's nucleus that is needed for transcription. DNA methylation is used in some genes to differentiate which gene copy is inherited from the father and which gene copy is inherited from the mother, a phenomenon known as imprinting. 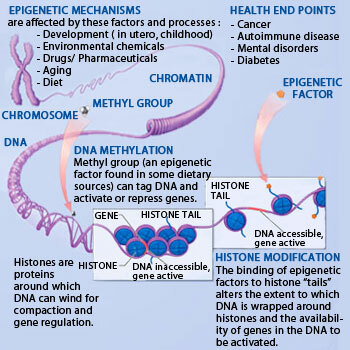 Epigenetic mechanism Epigenetics is the study of changes in gene expression or cellular phenotype, caused by mechanisms other than changes in the underlying DNA sequence. The chromatin modifications that we have just discussed do not involve a change in the DNA sequence, and yet they may be passed along to future generations of cells. Inheritance of traits transmitted by mechanisms not directly involving the nucleotide sequence is called epigenetic inheritance. Researchers are amassing more and more evidence for the importance of epigenetic information in regulation of gene expression. Clearly, enzymes that modify chromatin structure appear to be integral parts of the cell's machinery for regulating transcription. Epigenetics is involved in many normal cellular processes. Consider the fact that our cells all have the same DNA, but our bodies contain many different types of cells: neurons, liver cells, pancreatic cells, inflammatory cells, and others. How can this be? In short, cells, tissues, and organs differ because they have certain sets of genes that are "turned on" or expressed, as well as other sets that are "turned off" or inhibited. Epigenetic silencing is one way to turn genes off, and it can contribute to differential expression. Silencing might also explain, in part, why genetic twins are not phenotypically identical. In addition, Epigenetics is important for X-chromosome inactivation in female mammals, which is necessary so that females do not have twice the number of X-chromosome gene products as males. Thus, the significance of turning genes off via epigenetic changes is readily apparent. Within cells, there are three systems that can interact with each other to silence genes: DNA methylation, histone modifications, and RNA-associated silencing.